“The Word of the Lord,” coming from God Himself, changes what a person receives, from the normal into the supernatural. No longer are words only sound waves. For when something from eternal realms comes to another, they transform the event. The Almighty is speaking in His Word, which means He is also acting and doing. Consider creation, where physical matter forms into being from God’s breathed-out and moving Word. The Lord’s Word puts us in the presence of the divine, in language breathed out by God, common words no more but now, a revelation. So, what happens? The receiver of this heavenly discourse is removed from the ordinary and brought, and sometimes asked, to do the unusual and extraordinary. Take Isaiah. For three years, God commanded him to walk naked and barefoot, a warning of how Israel will be carried away into exile (Isaiah 20:2-4). This bizarre behavior won him no popularity contests. To Jeremiah, God spoke and appointed him over nations and kingdoms, to uproot and tear down, to destroy and overthrow, to build and plant (Jeremiah 1:10). Now, this didn’t sit well for Israel’s king seated on the throne. To an unfaithful Israel, God told Hosea, “Marry a prostitute, who will bear children of promiscuity.” Is this not insane? Still, God’s purpose is to paint a vivid picture, “Like an adulterous wife, this land is guilty of unfaithfulness to the Lord” (Hosea 1:2). So, when God’s spoken Word comes to Jonah, we should anticipate the unexpected. The Lord calls Jonah east, to Nineveh on a preaching task. Is this strange? Yes! For Nineveh is the capital city of Assyria, the archenemy of Israel. The neighboring nations hated the Assyrians. After conquering a country, these brutal captors impaled fishhooks through the noses of the vanquished, forcing them into slavery. Sometimes, their soldiers disemboweled the pregnant, showing little regard for life. Yeah, God is directing Jonah to preach to these people. So, we fathom why Jonah went in the opposite direction. In no time, he runs off to the coast and buys a ticket to head toward Tarshish, toward Spain, far away. What is your Ninevah? Whom do you despise? Well, say hello to your shipmate, Jonah. Oh, you understand God calls you to forgive and reconcile, for real. Like Jonah, you disregard Him. Perhaps, part of you is afraid this person might repent and enjoy the forgiveness and peace of God. Soon, the winds begin to squall, and a terrorizing storm beats down. Asleep, Jonah is unaware of everything going on above him. The cargo ship strains, creaking as the windswept waves become belligerent. The sailors all pray to their various gods. Not Jonah; no, others must wake him up and plead with him to call out to his God. Don’t miss this—unbelievers are begging the believer to live out his faith! These pagans realize the heavenly powers are angry at someone onboard. To find out who’s the cause, they cast lots. The marked pebble falls on Jonah. Through nonbelievers, God tells Jonah he cannot hide. So, Jonah reveals he is running away from “the God of heaven, who made the sea and the land.” A foreboding descends because Jonah’s God isn’t some local, two-bit deity. No, He created both mountain and ocean! These frightened deckhands now do their best to row back to shore, but all is futile. Anxious mariners panic, “What will we do?” “Throw me overboard,” Jonah howls amid the thrashing waves. To these worried shipmates, Jonah continues to unveil the true God. In Christ-like fashion, he is willing to sacrifice himself to rescue these estranged sailors. To spare them, Jonah must die. Like Christ, Jonah absolves the others by accepting the blame, ready to suffer death in their place and face his Maker. “So they picked up Jonah and threw him into the sea.” In the swirling depths, Jonah thinks himself a dead man. So, this is how I will perish, Jonah believes, as he descends into the deep. In Jonah, chapter 2, we find the water surrounding him, the whitecaps sweeping overhead. The stirring seaweed binds around his skull and neck, and he sinks, down, down, to the bottom. Still, the God over life and death doesn’t forget this disobedient man, for He remained with him all along. 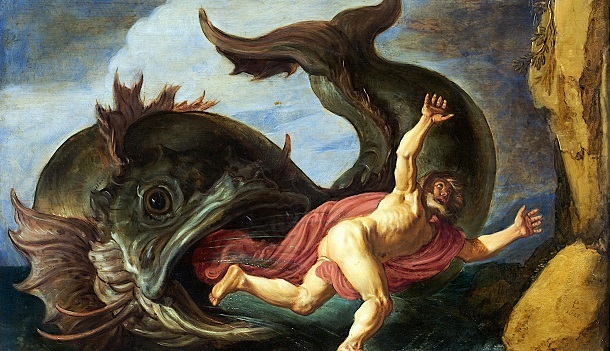 At the last moment, a monstrous fish swims by and swallows Jonah! In three days, the hapless prophet will find himself belched out on solid ground. Here’s God’s wondrous Word for you. For if you, as did Jonah, are running down rebellion’s path, God doesn’t give up on you. No, He is only absent if you leave Him, not the other way around. Learn from Jonah. The Creator of wind and wave isn’t weak and powerless to deliver. Remember Jonah! Like He did long ago, God remains faithful, down to the seaweed of your soul. The whole point of Jesus becoming incarnate testifies to this truth, who “came to seek and to save the lost” (Luke 19:10). So, He seeks your salvation at the one place where everyone will one day arrive—where death comes to claim you. The drowning waters envelop Jonah, but in the surrounding wetness, God pursues and saves him. In his fallen thinking, Jonah assumes God will send him to the Assyrians—alone and defenseless. The reluctant preacher needs to recognize his need for God and His deliverance, to understand the Lord will not forsake him. Despite running away and his smug self-deception, Jonah learns to trust God, who cares for and protects him. How can this be? On what day did the fish spew Jonah on to dry land? On the third day! This three-day rescue mission is the “sign of Jonah” Jesus refers to regarding His resurrection. “In the belly of the huge fish, Jonah spent three days and three nights. So also will the Son of Man be in the heart of the earth” (Matthew 12:40). Unable to hold Jonah, a queasy fish spits him out of his watery tomb. The grave will also be too weak to restrain Jesus, and He will step forth, rising from darkness and death. Are we so different from Jonah of old? The sins within us cause us to enter our water-filled grave, baptism, where the water buries us with Christ (Romans 6:3). Like Jonah, God still isn’t finished, for Jesus will deliver us out of death into new life, where we will rise with Him anew (Romans 6:5). The purpose for your new charter on life is not to run away. No, you instead carry out your calling by running to your Nineveh, to where God places you to serve. Still, our responses reveal the root of our sinfulness. How? In the crises of our lives, we put God on trial, accusing Him of injustice, being unreliable, or downright evil. In taxing times, we don’t want a saving God coming to us wrapped in the lowliness of creation. The Gospel Word proclaims, to this world’s way of thinking, a wimpy Savior, someone too feeble to stop His death. The means of grace appear no different. Resurrected power resides in water poured out in the Triune name. In pieces of bread and sips of wine, God forgives, which Jesus claims to contain His body and blood. The life-giving Word never impresses those clamoring to walk by sight, who want to experience splendor and glory now, not in eternity. All around us, catastrophes intrude, while the rescuing God appears to hide and cower in silence. The account of Jonah also shows we will not go unscathed and escape suffering in this sin-corrupted world. Though true, through Jonah, we also learn the Lord provides. Like God took an aspect of His creation to save Jonah, water, so too does He do with us. Did a glorious, fear-inspiring, storm-blasting event show God as all-powerful? No, a fish, hidden from everyone’s sight, rescues a worn-out and water-sodden man. Once near Ninevah, the Lord decides to use a vine to comfort Jonah with cooling shade. A worm will later come and cause the plant to shrivel, bringing judgment and correction to a hard-hearted Jonah. A burning wind will blow, causing Jonah to repent. “In, with, and under” these physical elements, God delivers His law and gospel. Regardless of whether Jonah digs in his heels or not, God’s grace to him and the Ninevites still prevail. Not only Jonah, but God’s restoring pardon also comes to re-create, to strengthen and renew you. So, what became of those Ninevites? Warned about God striking down their city, they reject their sin, and God commutes their death sentence. So, they too received a form of resurrection, for God’s plans for them included life. In their repentance, God spares them to live anew. Out of love, our enfleshed Lord died our death and rose again to give us life. In spite of all, He bore the cost of your sin. Why? So, He can be with you always—till the close of this age and the end of the earth. In His unfailing goodness, you can now depart, to love and serve your neighbor. For when Christ is with you and you are in Him, you cannot fail. Amen.